The group will most likely come up with a bill that would provide funding for the agencies and departments that went down for 35 days…. The agreement will NOT authorize money for a concrete and steel wall across the US/Mexican border …. It will probably have money for ‘barriers’ and ‘fences’….. It probably won’t contain a deal for the ‘Dreamers’ in the DACA program…. 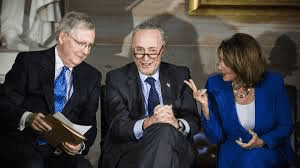 The lawmakers are confident they will find an agreement…. What happens when the bill they generate reaches Donald Trump’s desk? Leaders of both parties made clear that, after the nation’s longest-ever government shutdown ended late last month with Trump signing a short-term spending bill that included no new money for his wall, they want to reach finality soon to avoid another funding lapse. Conference committees have negotiated budget deals for years, but these talks are occurring at a moment of high anxiety — and enormous stakes. Lawmakers are loath to revisit another shutdown, but even as they negotiate a possible deal, neither side has any idea what Trump will accept. In recent weeks, some White House and congressional officials, including presidential adviser and son-in-law Jared Kushner, have floated the idea of expanding the talks, but the discussions remain narrowly focused. There is no guarantee that Trump will agree to the deal, raising the prospect of a repeat of late December, when lawmakers thought they had averted a shutdown until the president changed his mind. If a deal emerges but does not swiftly earn Trump’s backing, Senate Majority Leader Mitch McConnell (R-Ky.) would face a dilemma over whether to bring it to a vote anyway and potentially force Republicans to decide whether to support legislation that falls short of Trump’s wall. But few on Capitol Hill are eager to prolong the uncertainty by passing yet another stopgap spending bill. McConnell argued in a private meeting with senators Wednesday against passage of another short-term bill, according to a Republican with knowledge of the exchange who spoke on the condition of anonymity to describe it. “We’ve got to find some place in the middle,” said Rep. Steven M. Palazzo (R-Miss. ), who sits on the 17-member conference committee that is trying to produce a deal. “We know the Dems are absolutely not going to do 5.7 [billion dollars]. But what can they do — and what can we accept?”…. That is a shift from McConnell’s position during the 35-day government shutdown, when he insisted he would not bring anything to the Senate floor that he did not know the president would support and sign. After McConnell pushed through a shutdown-averting continuing resolutionin December that Trump had initially signaled he would sign and then backed off supporting, McConnell said he was not interested in any show votes. The conference committee, and its Feb. 15 deadline to strike a deal, has changed his calculus….